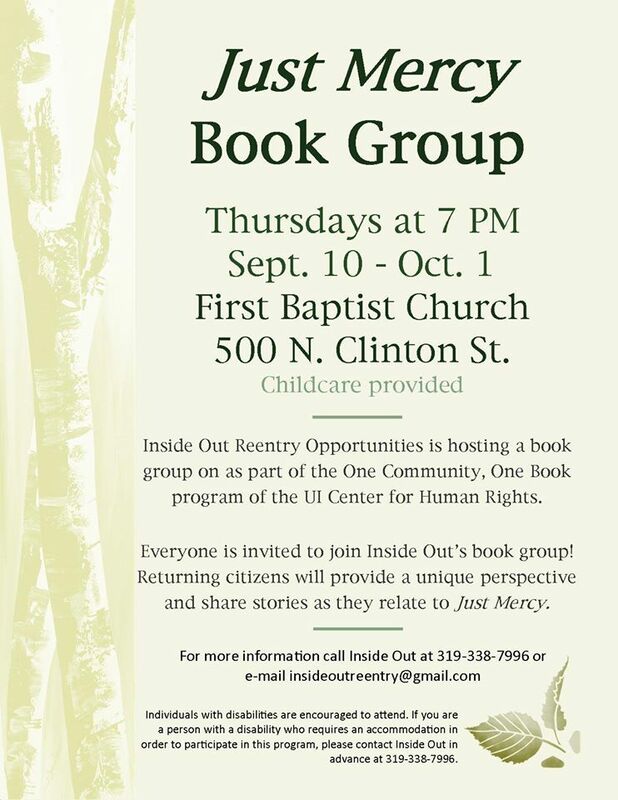 Inside Out Reentry will participate in Iowa City’s One Community, One Book program as part of its work for criminal justice education and reform. Inside Out invites the public to join in a discussion group on Bryan Stevenson’s Just Mercy on four Thursdays at 7:00 p.m., Sept. 10 – Oct. 1, prior to Stevenson’s talk at the Iowa Memorial Union on Sunday, Oct. 4 at 2:00 p.m.
Citizens who have returned to the community after incarceration will share their experiences in light of Stevenson’s book. Discussion of criminal justice reform efforts in Iowa will also be included. Participants are encouraged to read at least the first four chapters of Just Mercy prior to the first meeting. Starting in October, Inside Out will make a panel of returning citizens and volunteers available to schools and other organizations to talk about the criminal justice system and the need for reform. The UI Center for Human Rights, UNESCO City of Literature/Iowa City Book Festival and Geneva Lecture Series, along with Prairie Lights Books are bringing Bryan Stevenson, author of Just Mercy, to the IMU on October 4 to give a lecture. Bryan Stevenson is an attorney in Montgomery, Alabama who started a nonprofit group, the Equal Justice Initiative, http://www.eji.org, soon after finishing law school. This organization works with death penalty cases, race and poverty issues, children in prison, and mass incarceration. Just Mercy is primarily the story of Walter McMillian who was put on death row for a crime he did not commit and the six year effort by Bryan and others to eventually prove that he was unjustly accused and imprisoned. Inside Out will be collaborating to hold book discussions open to the public – it’s in the works! Next to family, corrections officials say a relationship with community is key to preventing an offender’s return to jail or prison. But building or rebuilding that connection can be difficult when one hasn’t been part of the community for months or years. “We’re trying to fill that hole,” said Nellie O’Mara-Morrissey, restorative justice community coordinator for the Each One Reach One program. O’Mara-Morrissey connects offenders with volunteers who can help them find work. That can mean volunteer work on community projects to build a work record and help with resume writing and job skills. Launched in 2007, Each One Reach One worked with 342 offenders in the Linn and Johnson counties over the past year, with 225 offenders finding employment. That success rate brought an offer of three years’ funding from state AmeriCorps, the Iowa branch of the federal community service program. AmeriCorps workers are the program’s staff. The AmeriCorps members work for free, but the grant of $460,435 a year for three years would cover the cost of 50 members in Linn, Johnson, and Tama counties, according to Jean Kuehl, assistant director of Department of Correctional Services for the Cedar Rapids-based 6th Judicial District. State budget cuts and a hiring freeze sent Kuehl on a search to cover the grant’s $50,000 local match. Linn County has granted $15,000, and North Liberty $4,000. Kuehl continues to seek awards from Johnson County and other potential donors, including the cities of Cedar Rapids and Iowa City. Linn County’s grant will fund five full-time and seven part-time AmeriCorps workers in the county. A full-time employee at Iowa Workforce Development, Clarence Borck directs offenders with community-service sentences to the Johnson County work crew he supervises for Each One Reach One. He may also place offenders where they can build a resume — Habitat for Humanity for an offender interested in working as a builder, for instance. “I see them full-time in a structured environment (at Workforce), and I see them in an environment part-time where they can let their hair down and have fun and at the same time give back to the community,” said Borck, 49, of Iowa City. The new grants will bring “more resources available to help these kids on the front end,” Kuehl said. That will come through Children of Promise and Trailblazers, a Boy Scouts program for at-risk youth. “There’s a fine line between at-risk and troubled, and a lot of people don’t recognize that,” said Quintin Thurmond, AmeriCorps coordinator for Trailblazers. Thurmond works with the Boy Scouts organization to run Boy and Cub Scout troops meeting at five Cedar Rapids locations. He makes sure the scouts have transportation to their weekly meetings and plans day trips to the Scouts’ Howard H. Cherry Reservation and overnight camps on the Mount Mercy University and Kirkwood Community College campuses. Children of Promise matches volunteer mentors with children who have a family member in the correctional system. Children are referred through corrections staff, churches, or other community groups. AmeriCorps member Jenny Evans recruits, interviews, and trains mentors who agree to spend at least an hour a week with them. She said there are now about 65 children in the program. “After this, I will probably stick with the program and become a mentor,” said Evans, 28, of Iowa City, about to begin her last yearlong AmeriCorps term.